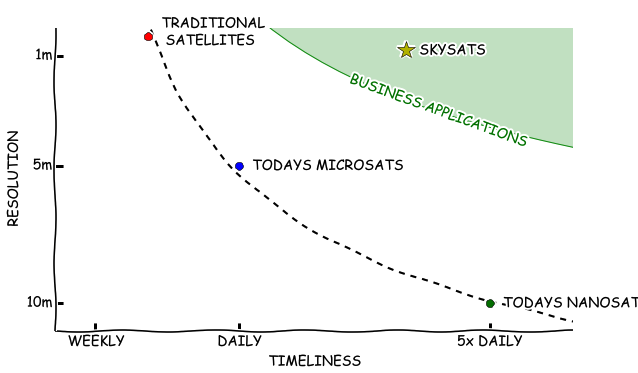 This is the first post in a three part series detailing the value proposition of our small spacecraft platform, the design philosophy and team that enabled it and why it is uniquely enabling for business intelligence applications. The Skybox vision is to leverage timely satellite data to provide insight into daily global activity. Such data has wide value in industries such as agriculture, asset monitoring, security, supply chain management and many more. They are valuable ( and probably always will be) because satellites are unique in type, quantity and global nature of data and services they can provide.They are expensive and risky because getting to space and doing interesting things there is hard. aerospace. Because launch costs are a significant fraction of a satellite deployment cost, simply making satellites smaller is a first step in breaking the inflationary cost cycle. But smaller alone does not a revolution make. To truly “move off the curve”, small satellites must also pack huge capability into tight mass, power and cost constraints. Today’s traditional, large spacecraft CAN capture data at the high resolution needed to monitor global human activity but because of their enormous capital cost (and, hence, limited numbers), they produce data too infrequently to enable many monitoring or change detection applications. 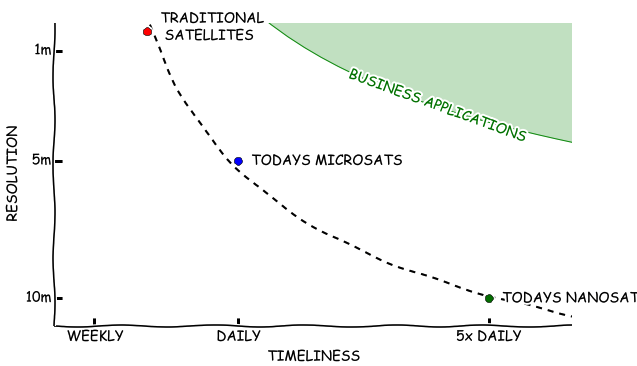 Today’s micro- and nano-sats can be launched in quantity because of their lower cost but can’t produce data with high enough resolution to monitor economic-scale change (cars in parking lots, ships in ports, supply chain monitoring, …). To move off the frontier, a system must both capture data of high enough quality (resolution) to show economic activity and be cost-effective enough to deploy in large numbers (timeliness). The commercial micro-electronics revolution and Moore’s law have pushed the green line up disproportionality at the smaller end of the spacecraft scale while economics of launch, capital financing and risk aversion in aerospace have pushed the cost up sharply at the larger end. Over the last 20 years, a “bubble of opportunity” has arisen in the nano- and micro-satellite scales. So we ended up asking ourselves the question “What’s the smallest box I can fit something of real commercial value into?”. We spent the first 3 months of the design of SkySat-1 trying to answer this question, carefully balancing the state of the art and the realities of physics. The answer came by combining tightly integrated system architecture, modularity in both hardware and software, techniques that allow us to leverage the incredible performance of modern commercial-off-the-shelf (COTS) components in space and the best engineering team in the industry. Stay tuned to Part II where we will discuss our unique design philosophy and how it enables the Skybox space and data platform. 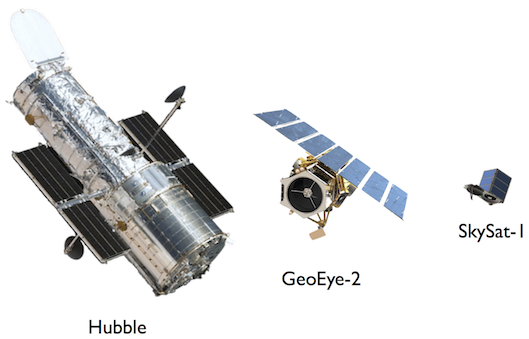 In Part III we discuss what we look for in engineers and how we built our exceptional team and in Part IV we will elaborate on the way we traded capability vs. size and why we think the SkySat platform is right in the sweet-spot. SkySat-1 is arguably the highest performance micro-satellite ever built. Since its launch 3 months ago, it has delivered terabytes of spectacular sub-meter imagery and video - data of incredible business value - at a cost more than an order of magnitude less than comparable existing systems. Orbital will launch six of our commercial high-resolution imaging and video-capable satellites into a 500-kilometer sun-synchronous orbit aboard the Minotaur-C space launch vehicle. 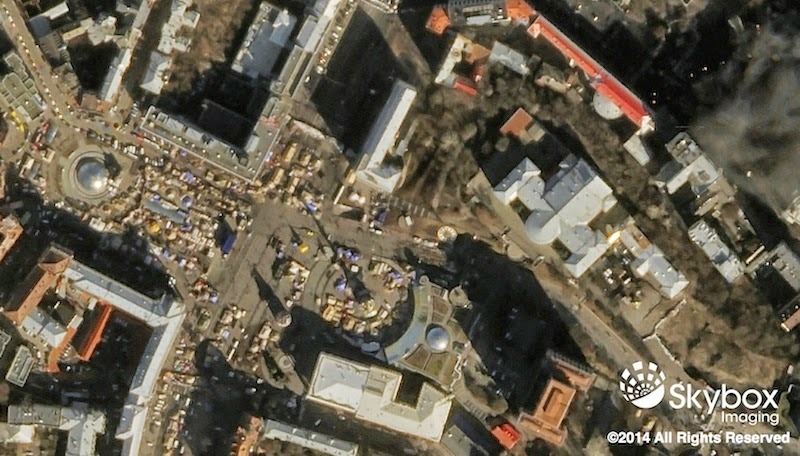 These satellites are designed to deliver <80 cm resolution. The launch is scheduled from California’s Vandenberg Air Force Base late next year and we couldn’t be more thrilled. More details can be found here. As our team continues working toward the launch of our planned constellation of 24 satellites, we have a huge development to share: we’ve signed a commercial launch contract with Orbital Sciences Corporation. (SSL) / MacDonald, Dettwiler, and Associates, Ltd. (MDA) to build 13 satellites to be launched in 2015 and 2016. This is a watershed moment for us as we look to scale our constellation – once these are up, we’ll be able to revisit any point on Earth three times per day. The satellites, which will weigh roughly 120 kilograms each with dimensions of 60x60x95 centimeters, will be built based on our prototypes, designs and specs. 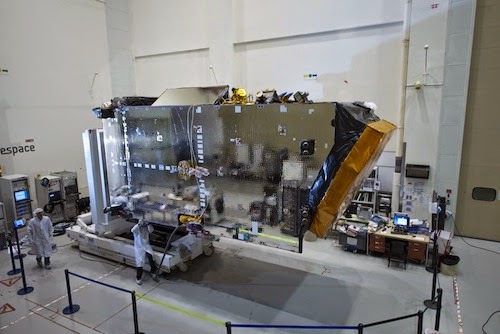 Similar to SkySat-1, the satellites built by SSL will capture sub-meter color imagery and up to 90-second clips of HD video with 30 frames per second. We will continue to prototype new generation systems in-house while leveraging SSL/MDA's production capabilities to deploy our constellation with greater speed and cost efficiency. To read more about our partnership with SSL/MDA, please click here. Today we’re announcing a new partnership with Space Systems/Loral (SSL) / MacDonald, Dettwiler, and Associates, Ltd. (MDA) to build 13 satellites to be launched in 2015 and 2016. This is a watershed moment for us as we look to scale our constellation – once these are up, we’ll be able to revisit any point on Earth three times per day.